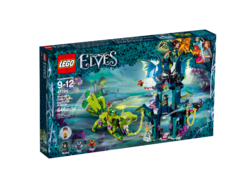 41194 Noctura's Tower & the Earth Fox Rescue is an Elves set released on January 1, 2018. Rescue the captured Guardian Earth Fox from Noctura’s tower! 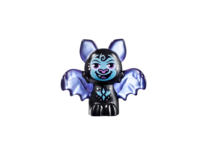 Seek the magic within to help Farran free the Guardian Earth Fox and then together face Noctura and her evil shadow bats! 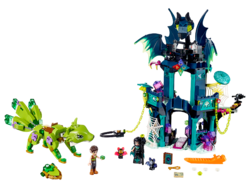 This fantastic LEGO® Elves creative play set features a fully posable and buildable earth fox with opening jaw and movable legs, head and translucent tail, plus a 2-level tower with opening translucent bat wings, moving head, spiderweb trap/door, disc shooter, space for the 4 Elemental ‘diamonds' and additional accessories. Includes 2 mini-doll figures plus spider and 2 bat figures. 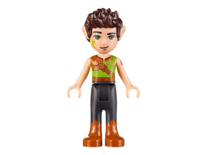 Includes Farran and Noctura mini-doll figures, plus Molo and Hippo shadow bat figures and a spider figure. Features a fully posable and buildable Liska the Guardian Earth Fox figure with movable translucent tail, legs and head, opening jaw, and space on the head for a magic Earth ‘diamond. Also includes a 2-level Tower of Shadows with large bat wings and head that lift up to reveal the upper floor, tipping potion bottles and cauldron, opening spiderweb trap/door, shooter, chain release function, space on the front of the tower for the 4 Elemental ‘diamonds’ and a hanging nook for the bats. Turn the knob on the back of the tower to lift up the translucent bat wings and head to reveal the stolen Elemental ‘diamonds’. Turn the gear in the potion room to ‘mix' the potion bottles. Raise the spiderweb trap to capture Farran in the tower's lower level. Tip the mushroom down to free the chain attached to the tower. Accessory elements include Farran's magical earth shield, 2 shooting web discs, Noctura’s shadow staff, map, lock, chain, 3 potion bottles, skull in a jar, chicken leg, 2 ‘golden’ keys, lettuce and 4 Elemental magic ‘diamonds’. This awesome creative play set is suitable for ages 9-12. Guardian Earth Fox measures over 3” (9cm) high, 8” (21cm) long and 3” (9cm) wide. Noctura's tower measures over 11” (28cm) high, 7” (20cm) wide and 3” (8cm) deep. Facts about "41194 Noctura's Tower & the Earth Fox Rescue"